Link cable and Mobile Adapter support (Japan only). 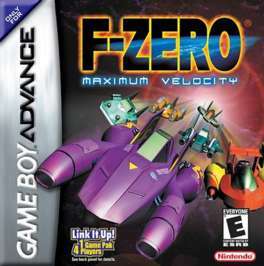 As launch title for the Game Boy Advance, F-Zero: Maximum Velocity was a SNES-look-a-like in terms of playability. 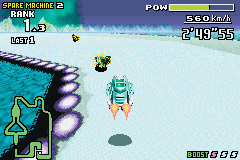 But once the shock of a portable F-Zero game has worn off, you'll realize that this is one of the better GBA racing games out there. 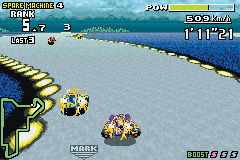 Add in 4-player action, Championship mode, and (in Japan) the ability to trade scores with cell phones, and you have a great racer. 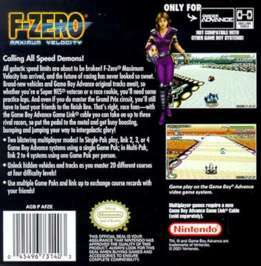 - Only US-released F-Zero game without Captain Falcon, Samurai Goroh, Pico, or Dr. Stewart. 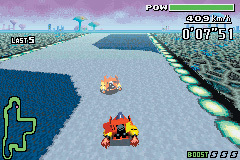 Captain Falcon, Dr. Stewart... 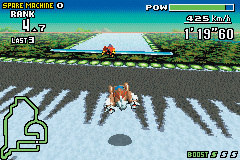 It's been a quarter of a century since they piloted their way to fame as F-Zero racers, and as time has passed, their days of glory have faded into something resembling legend. The extreme danger involved in F-Zero has caused some to call for an end to these races, but now a new generation of pilots have emerged and is looking to continue writing the sport's history. It is a timeless quest for victory, fame and fortune. Mankind had settled into a period of relative calm following its great leap into space. Among those recovering from the initial space race frenzy were powerful merchants of the day. They had learned through experience that, while the far reaches of space offered incredible trading opportunities, the enormous distances opened them up to the ravages of piracy. They realized that they couldn't afford the cost of constantly being robbed, so they settled into simply regulating and defending their existing territories. 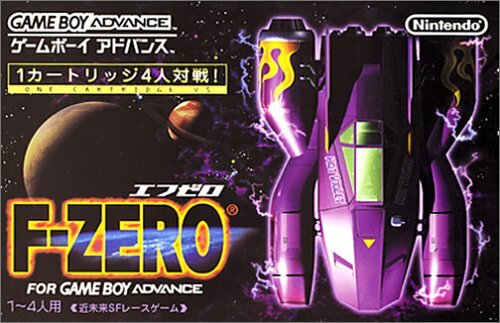 Their conservative business practices put a lot of high-priced space pilots out of work, and so there came a rise in the number of daring men and women looking to get rich quick the only way left to them... as F-Zero pilots.